HB: What was it about Harlem that inspired you to write this book? JG: Harlem had provided me with so many cultural touchstones for so much of my life—James Brown’s live recordings at the Apollo, the various talents who emerged from Amateur Night, the Shot Heard Round the World at the Polo Grounds, Henry Roth’s novels, Malcolm X’s assassination, Ellington at the Cotton Club, and the Last Poets, just to name a few. But like most Americans, I took Harlem’s importance for granted. Then in 1999 I was having a conversation with one of my graduate students in the history department at Columbia and she asked me a question about, I think, African Americans and the labor movement, and I was about to point her to the standard history of Harlem, when I realized it didn’t exist. 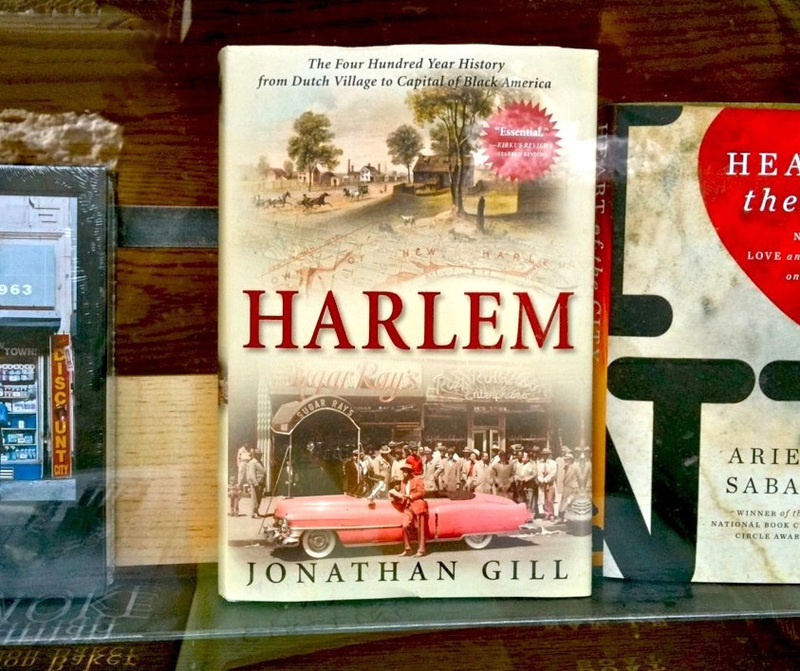 The fact that there was no one place to go to get a grasp on the totality of Harlem’s history struck me as an unconscionable gap in our scholarship, as well as a project that would be, well, enormous fun to do. The chance to do original, meaningful research on a subject so central to our experience as Americans was too good to pass up. At the time, we were living on Manhattan Avenue, and our neighbors would from time to time mention that, for example, Ella Fitzgerald used to live in this building, or Romare Bearden in that one, and I had no easy way of verifying these facts. Of course, with the internet, it’s become easier—all you have to do is type in “Norman Rockwell” and Harlem and you can find out he grew up at 789 St. Nicholas Avenue. But the internet is in some respects a crude tool—or is it overly sensitive?—for researching history, and there’s no substitute for the shoe-leather and dusty periodical room way. What a disappointment to find that the famed “Niggerati Manor” is now a parking lot, or that the tenement where Allen Ginsberg had his famous Blake vision was swallowed up by a housing project. HB: If you could go back to visit one particular period, which would it be and why? JG: I’m not one of those people who sees the 1920s or the Harlem Renaissance as the high point of Harlem history, as amazing as it was. Strangely enough, I’d like to have experienced Harlem in the 1930s, which was a desperate time economically for most Harlemites, but also the time when the ferment over communism was at its height, when swing was turning into bebop, when bandstands and recording sessions were being racially integrated, when Langston Hughes and Zora Neale Hurston and Aaron Douglas were doing their best work, when the WPA was in full swing, when Adam Clayton Powell, Jr. and A. Philip Randolph and Bayard Rustin were inventing the modern Civil Rights Movement—before heroin arrived. HB: Do you live in Harlem or have had relatives from the past who lived in Harlem? JG: I lived uptown from the early 1980s until I moved with my wife (who’s Dutch) and two boys to the Netherlands in 2005. Some of it was in Morningside Heights, where I was studying and then teaching at Columbia, but we also lived in Harlem proper, at Manhattan Avenue and West 115th Street, in a truly horrendous building. This was back when Morningside Park was still pretty much a no-go zone, though by the time we left it had undergone an amazing transformation. As for my own family history, I come from pure mongrel Jewish-Polish-Ukrainian-Russian stock, but via the Lower East Side and Brooklyn and the Bronx. The only time genealogy got personal was when I read about how George Gershwin played one of his last concerts in Lewisohn Stadium on the hottest day in New York City history. Now I’d always heard my grandmother tell that my father was born on the hottest day ever—we always thought it was just a combination of bragging and complaining, but then I connected to the two dates: July 9, 1936. Grandma was right! 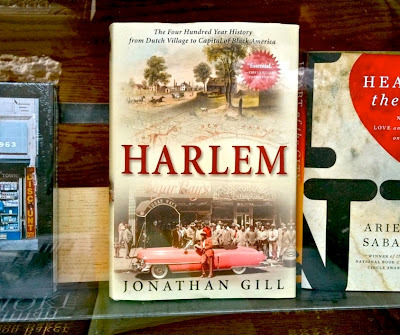 Having said that, in the course of my research and writing, I did come across people with fascinating personal connections to historical Harlem. The superintendent in our building on West 122nd Street was Richard Fontanelle, who as a child took part in the famous, terrifying series of photographs that Gordon Parks made of his family for a series on poverty for Life Magazine back in the 1960s. One of my students at City College was the great-grand-daughter of A. Philip Randolph. Another had grown up with James Baldwin’s family—knew them from neighborhood barbecues or just hanging out on the stoop. HB: Is there any one particular discovery that surprised you the most? JG: There wasn’t a day in all those years of research that didn’t yield surprises. I can’t say I made any earth-shaking discoveries about Duke Ellington or Langston Hughes. But how many of us appreciate the fact that the greatest political, military, legal, and economic mind of the American Revolution, Alexander Hamilton, lived uptown—as did the man who murdered him, Vice President Aaron Burr! Or how the two most significant American artists of the nineteenth century, John James Audubon and Thomas Nast, were Harlemites (not to mention,a century later, Alice Neel, who lived in East Harlem). And then there’s the entertainment history: Harry Houdini, George Gershwin, Richard Rodgers and Larry Hart and Oscar Hammerstein II, the Marx Brothers, Milton Berle (and later Jules Dassin). How about the notion that jazz was invented not in New Orleans but in Harlem, by James Reese Europe! And in literature, Henry Roth and Arthur Miller. So part of my project was recasting and re-seeing some of our most cherished legends as Harlemites. You’ll notice that most my examples are white—in trying to do justice to the complexities of Harlem’s history, I was continually surprised to find that there was never just one Harlem, politically, racially, musically, architecturally, or artistically. There were always African Americans in white Harlem, and even when Harlem became predominantly black, there were significant numbers of whites, and not just only Latinos or slummers. In the heyday of left-wing politics, there were plenty of conservatives uptown. At a time when homosexuality was forbidden by law or custom, there were openly gay Harlemites. I guess I also surprised myself when what I learned about many of Harlem’s most revered political figures—especially Marcus Garvey and the leaders of the Black Panthers—forced me to re-evaluate my very romantic, somewhat adolescent ideas about “revolution.” I wouldn’t go so far as to say I side with political conservatives today who revere Hamilton, but I realized that I had found some new heroes. I call them the “peace warriors”: Norman Thomas, A. Philip Randolph, Vito Marcantonio, and Bayard Rustin. As far as the discipline of history goes, I’m not one of those American exceptionlists, who believe America has a unique history and maybe even divine mission in the world—but I am a Harlem exceptionalist. There’s never been anything like it—even New Orleans and Chicago can’t compare. Any plans to bring this book to the Kindle? This is so necessary. I'm sure it's an amazing story. Just ordered my copy. THANK YOU both, Ulysses and Jonathan Gill. Harlem itself is huge and impossible to put in one box, similarly Harlem’s history is diverse and complex, seems like this book is not limiting itself to one part of Harlem’s long and varied history, this will go on my reading list. Thanks for a great interview and post. God Bless You Once Again Ulysees! Is this book full of illustrations (in which case I'd want a paper copy), or is it just text (in which case I'd get it on my Kindle, which I prefer)? Anyone know? Yes, my copy has two photo inserts--so 32 pages of photos. For those who inquired, I understand from my publisher that a Kindle edition will be available in a few days. Also, I'd be glad to answer any questions Harlem Bespoke readers might have, anything from details about a particular building or historical figure to broader themes. At the very least, if I can't answer the question myself, I could point out places to look further. Mine just arrived from Amazon (I know--I should have gone to a real book store) and it looks wonderful. Can't wait to dive in. Question for Jonathan Gill, I understand Harlem was farmland, then elevated trains, then street grid, then brownstones, I am sure I am oversimplifying and maybe the order is wrong however, can you put date ranges to each of these stages in Harlem’s development and especially the first brownstones and where? Many thanks. There's no one easy timeline, because parts of Harlem (Manhattanville and to a lesser extent Carmansville on the Hudson, and the old village of Harlem on the Harlem River) were industrialized and urbanized well before the Civil War, while other parts remained unbuilt well into the 1920s (the Abyssinian Baptist Church was built on farmland). Remember also that the 1811 street grid was purely theoretical uptown for much of the nineteenth century. As for transportation, horse-drawn and steam-driven trains overlapped with the elevated, which overlapped with the subway. But to be very general, we can say that Harlem was largely rural until the large plots were broken up and sold off in the decades after the Civil War. Big mansions rose uptown throughout the eighteenth and nineteenth centuries. In contrast, the brownstone era uptown is, again roughly speaking (and by brownstone I mean a single-family, two-to-four-story residence or rowhouse), from the 1880s (mostly in lower Harlem, especially surrounding what was then Mount Morris Park) through World War I, while the tenement era (by tenement I mean a multi-unit building from four to six stories) lasts from the the 1860s to the 1920s (mostly near the urbanized sections, again, by the rivers). Before the turn of the century, elevator technology leads to the rise of apartment houses, mostly in lower Harlem and along the parks. Why such haphazard development? Because uptown Manhattan developed both spontaneously (laborers needed cheap housing near the factories where they worked and rich downtowners wanted to locate their mansions and townhouses in cleaner, quieter neighborhoods) but also in response to top-down plans coming from downtown--remember that mass transportation arrived uptown before the masses, i.e., not in response to demand but as a way of creating demand. The best guide here is either the AIA Guide or Robert A.M. Stern. Or, take advantage of the benign neglect that has been both a blessing and curse uptown and check things out in person: The Dyckman farmhouse; the Hamilton Grange and Morris-Jumel Mansion; the most representative tenements are in East Harlem and on either side of Broadway in the West 140s; the brownstones west of Mount Morris Park; the Grinnell on West 116th Street as representative of the grand apartment house. As for transportation, you can still see the trolley rails in the pavement under the Manhattanville viaduct. This is off the top of my head, but I hope it helps! Jonathan, thanks for a comprehensive answer and references. Hey, after reading the post here, just picked up a copy at B&N. What a great, comprehensive book on Harlem. Incredibly detailed and very intelligently written. Some very interesting things to say about some famous Harlem-ites - this guy holds nothing back. Well done. I just came across this book-WOW I knew some of the early Dutch but this gives me alot more. I am decended from Johannis/Jean de la Montagne. I only wished the Dutch treated the natives fairly. His daughter, Rachel de la Montagne Van Imbroch was captured by the natives and escaped. Luckily her children were not hurt in the raid that did kill many villagers- One of Rachel's decendants is Teddy Roosevelt.